Universal, easy-to-use method for shade matching. Includes standard shades: A1, A2, A3, A3.5, A4, B1, B2, B3, B4, C1, C2, C3, C4, D2, D3, and D4. Fully autoclavable holder and shade tabs. Improved, larger stainless steel shade tab holders for greater durability. Larger shade font for fast identification of shades. Slightly darker shaded gray holder offering improved shade assessment. Designed to facilitate precise and repeatable Vitapan shade selection using a fast, efficient, three-step process applying lightness (value), chroma (saturation) and hue (yellow-red shift). For planning and monitoring of patient’s tooth whitening regimen. Offers new intermediate shade tabs for measuring bleaching progress. Guide contains 15 shade tabs of ½ level increments of lightness, with the chroma increasing while the lightness decreases. Features a sleeker, linear design that makes the process of precise shade determination even faster and easier. 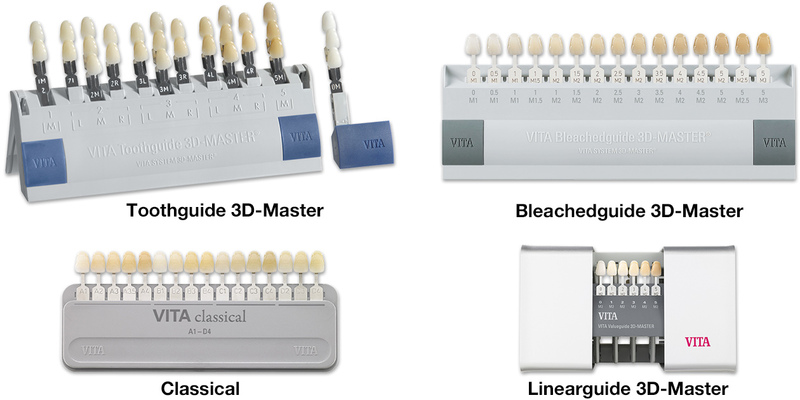 Contains the same 29 shade samples as the Toothshade 3D-Master. Contains: 16 shade tabs, 1 base. Contains: 26 shade tabs, 3 bleached tabs, 1 linear base. Contains: 15 shade tabs, 1 autoclavable base. Contains: 26 shade tabs, 3 bleached tabs, 1 autoclavable base.